WASHINGTON – Like his three brothers and a brother-in-law, Sun City resident Carl Neuenfeldt served in World War II, but while they were in the Atlantic Theater he was in the Pacific. 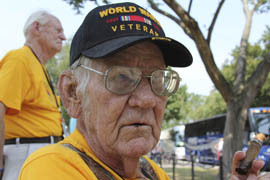 Neuenfeldt thought of them Wednesday as he sat in the Pacific Theater pavilion at the World War II Memorial, looking off across a pool toward the Atlantic Theater pavilion. 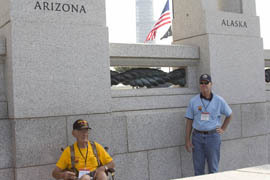 He was one of 30 World War II veterans from Arizona who were in Washington to see “their memorial” Wednesday, courtesy of Honor Flight Arizona. 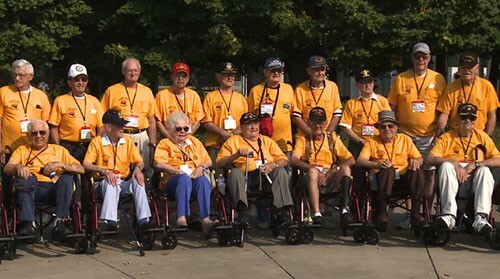 It is one branch of a national charity network that flies the veterans to Washington for free. 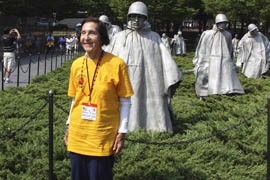 The Arizona group, outfitted in bright yellow T-shirts, lingered at their memorial before visiting the Korean and Vietnam War memorials, the U.S. Marine Corps War Memorial – better known as the Iwo Jima Memorial – and others. Between puffs on a cigar, Dugger said he joined the Army in June 1944 and went into combat the following January. 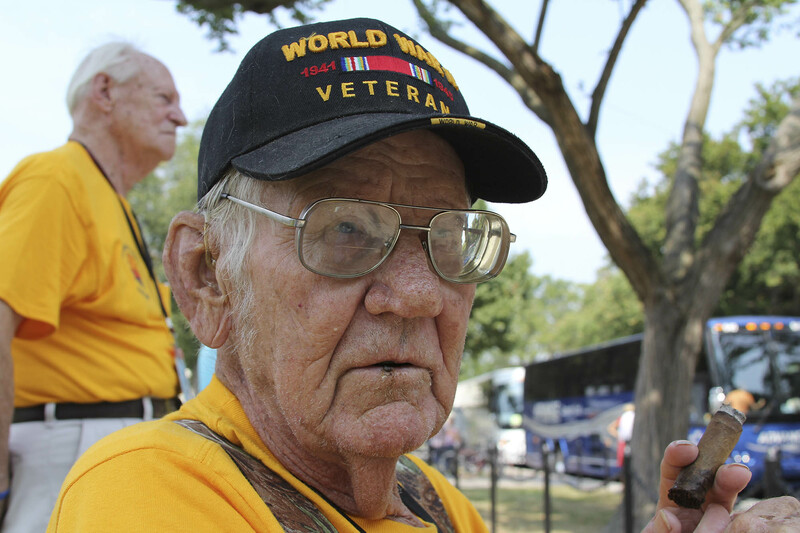 The visit to the memorials and Arlington National Cemetery Wednesday gave Honor Flight veterans an opportunity to reflect on their service and what it means in a post-9/11 world. “It makes you realize how important the past years were and how important the military was – and still is,” said Helen Coyte, 91, a Phoenix resident. She was working in a defense plant in Bridgeport, Conn., but jumped at the chance to enlist when the Navy began accepting women. Coyte said she was making “very good money” as a “Rosie the Riveter,” but that joining the WAVES “opened up a whole new world for me,” that made giving up the money from her plant job worthwhile. “As a matter of fact, I am still benefiting from being in the service,” said Coyte, saying she was able to attend college on the GI Bill, which also helped her and her husband buy their first home. Elsie Incardona was 23 when she joined the Coast Guard at a fair in her small Minnesota hometown, where she had been working in a department store but seeking adventure. The role women played then was more limited than in the modern military, she said. But it gave her the opportunity to travel, Incardona said. This week’s trip to Washington was something of a homecoming for Coyte, who served in the nation’s capital from 1943 to 1946. It wasn’t the only part of her wartime experience Coyte revisited this week: For her return to the nation’s capital, she got back into her WAVES uniform 70 years after her service, something that is a challenge for many vets just months afterward. Seeing the Iwo Jima Memorial was “hard to put into words” for Lee Paul of Chino Valley, who said he served on Iwo Jima during the war and saw the original flag raising depicted by the memorial statue. “It’s just a reminder – all of us gave our youth and some gave our entire lives,” he said. The fact that the trip took place on the 12th anniversary of the 9/11 terrorist attacks at the World Trade Center and the Pentagon added a little extra significance for several of the veterans. 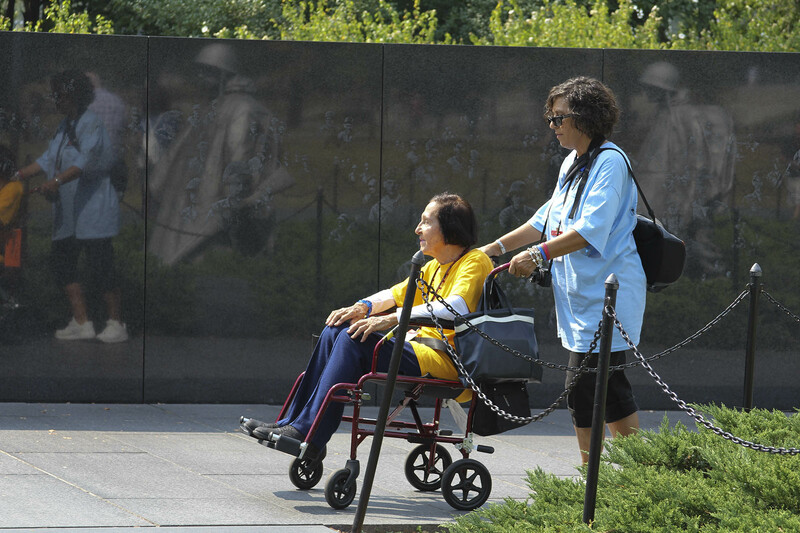 WWII veterans from Arizona are now able to visit their memorial in our nation's capital. Cronkite News reporterJohn Genovese has the story. 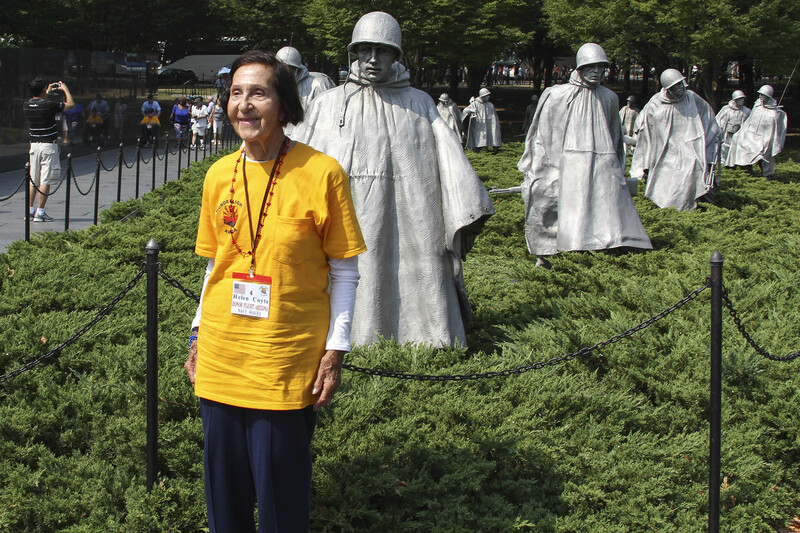 Phoenix resident Helen Coyte, 91, poses for a photo in front of the Korean War Memorial at the National Mall in Washingto, D.C. Coyte was in Washington with Honor Flight Arizona. Army veteran Bill Dugger, 87, of Fountain Hills, was in Washington, D.C., with Honor Flight Arizona to visit the World War II memorial, and others. 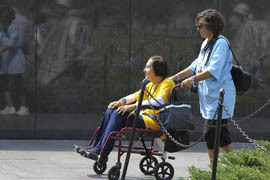 Carla Ford pushes Helen Coyte along a path at the Korean War Memorial in Washington. Coyte, a Navy veteran and Ford's mother, Coast Guard veteran Elsie Incardona of Yarnell, were a part of the Honor Flight Arizona trip to Washington. 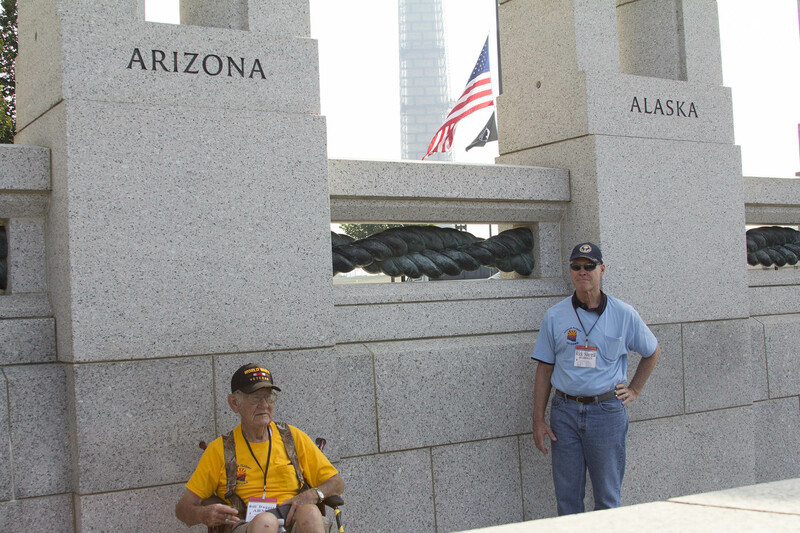 Army veteran and Fountain Hills resident Bill Dugger poses for a photo in front of the Arizona state column at the National World War II Memorial in Washington, D.C., as Honor Flight chaperone Rick Sherrill looks on.